Fruit, vegetables, meat and milk produced closer to home rack up fewer "petroleum miles" than products trucked cross-country to your table. How do you find them? Search localharvest.org by ZIP code for farmers' markets, greengrocers and food co-ops in your area. The website, which includes handy contact information in its directory listings, also identifies restaurants that specialize in regional and seasonal ingredients. If you really want to get close to the farm, join a Community Supported Agriculture project, which lets you buy shares in a farmer's annual harvest. In return, you get a box of produce every week for a season. 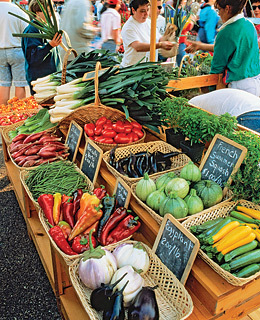 It will take more than a few visits to the farm stand to reduce the carbon impact of the U.S. food supply. In the meantime, here's another reason to go local: the taste is great.